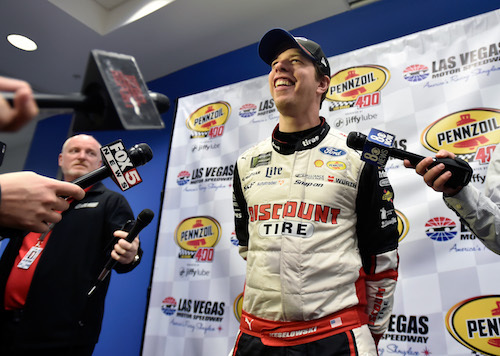 Brad Keselowski clinched his 2018 Monster Energy NASCAR Cup Series playoff berth on points a few races early, but he closed out the regular season with two-consecutive win, the most recent coming in the Big Machine Vodka 400 at the Brickyard on Monday at Indianapolis Motor Speedway. The race was delayed a day to Monday as a result of rain throughout the weekend. The win was the 499th NASCAR national-series win for car owner Roger Penske but his first Cup Series win at Indianapolis. The Brickyard 400 win Monday did put a period on an Indianapolis 2018 major sweep for Penske, as he was the winning car owner of the Indianapolis 500 in May. After a side-by-side battle for the lead on a restart with three laps remaining in the 160-lap race, Keselowski took the lead from Denny Hamlin with about a lap-and-a-half remaining. “Cautions killed us at the end,” Hamlin said. Erik Jones also got by Hamlin to finish second. Hamlin was third and Stewart-Haas Racing teammates Kevin Harvick and Clint Bowyer rounded out the top-five. Hamlin and Bowyer tied for most laps led, each running up front for 37. They were the top-two in the running order for most of the six laps that made up the 60-lap final stage. Bowyer took the lead and Hamlin second on the restart early in stage three. Hamlin took the lead by pitting just before Bowyer under green on lap 126. Kyle Busch and Kevin Harvick started the race on the front row as a result of the starting grid being set by car owner points. They each led laps early, but varying pit strategies surrounding several cautions, including two scheduled competition cautions and two others at stage ends, cycled several drivers to the front of the race field. Stage winers were Bowyer and Matt Kenseth. Harvick and Busch both managed top-10 finishes after problems on pit road. Harvick was penalized for an uncontrolled tire when he pitted just before a lap-10 competition caution, and his team struggled with a pit gun just before a lap-30 competition caution. Busch finished eighth after a penalty for a commitment line violation on lap 98, just before the end of the second stage. Busch was a winner on Monday, though, as he was recognized as the regular-season champion. While Harvick and Busch were able to rebound from their pit-road problems to finish in the top-10, their fellow “Big Three” driver, Martin Truex Jr. wrecked on lap 41 and wound up last, retiring the race after starting in the back and working his way part of the way to the front. He dropped to the back at the start of the race because of inspection problems Saturday. Hendrick Motorsports teammates Jimmie Johnson and Alex Bowman turned provisional playoff advancing spots into official playoff berths with Monday’s race producing a repeat winner. Neither Johnson finished the Brickyard 400 in the top-10, though. Johnson wound up 16th. Bowman was 33rd after wrecking with A.J. Allmendinger on lap 67. Other top-10 finishers included Kurt Busch in sixth, Jamie McMurray seventh, Paul Menard ninth, and Ryan Newman in 10th.